These solid wood Colonial style dining chairs feature exception Amish quality construction. They will brings the grace and beauty of the Windsor design into your home or business. The intricately carved central slot is a true work of art, adding a twist to this Windsor chair design. Complement your country furniture collection with this Windsor Slot Captains Chair or dress your dining room with these colonial style dining chairs. 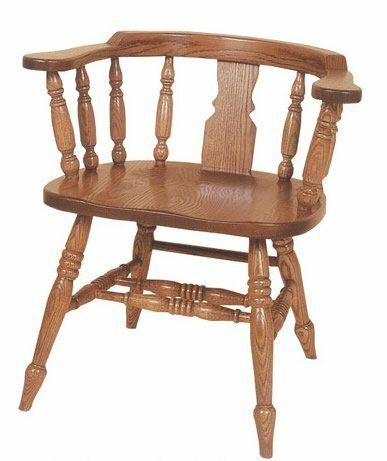 The chair back is a collection of fine Amish woodworking on display and offers the comfort you need in a quality dining chair. From the spacious seat to the beautifully turned legs, these solid wood dining chairs will complement your dining room furniture collection with ease. The captain's chairs come standard with an arm for dining comfort. Choose oak or cherry wood for these custom made dining chairs. Oak furniture creates a warm atmosphere in any room while cherry wood furniture is strong and distinguished. Choose to have these Windsor Captains Chairs unfinished or select from a variety of stain options. Browse more of our Colonial American Furniture collection for your home or business. We offer a wide variety of captain's chairs or mate chairs in a classic Windsor style. Please call with questions about our Windsor style furniture. You can reach one of our Amish furniture specialists today at 1-866-272-6773. DutchCafters provides just the right solid wood furniture for business. Visit our Contract Sales Page to find out more about ordering these Captains Chairs for your restaurant or hotel. We're committed to providing you with quality furniture that will last. Height from Floor to Top of Seat: 17"
Height from Floor to Top of Back: 26"
Overall Width with Arms: 26"
Shown in Oak with OCS-103 Stain.